We received 2 pair of sunglasses. We received the Looping 3 in White/Lime for Emerson (ages 2-4) and the Davina in pink for ages 6-10 for Avery. The glasses fit my kids perfectly. Emerson is almost 2 and has a bit of growing room in his Looping 3's, but overall the fit is great and they stay on his little head/face perfectly. He loves these. He has a huge thing for glasses and these are just perfect for him! He likes to even wear them around the house, so silly! The Davina's fit my 6.5 year old daughter perfectly as well. Again a bit of room to grow, but overall a good fit. 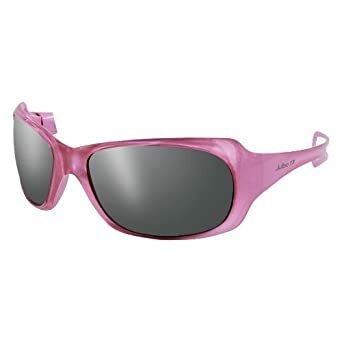 I couldn't be happier with my Julbo Sunglasses. The Looping 3s have Curved Temples and a flat elastic strap that help keep them on, but we don't even need the strap at all. They also have a nice wrap around profile to protect baby's eyes from all angles. The Davina's are also a wrap around model that covers from all angles and they have flexible temples. They are very sporty looking and look grown up, that's why my daughter likes them so much! Price: The Looping are $32 and the Davinas are $45.